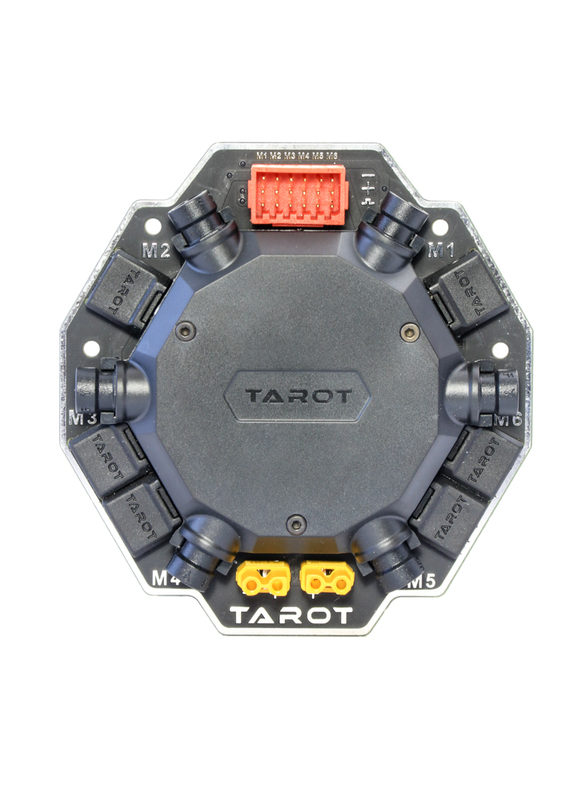 The board is designed for hexacopters so it features six ESC signal inputs labeled M1 to M6. The connections are outputted together respectively at the signal hub, ready for you to connect with your flight controller*. On the power distribution side of things, the board has six coaxial power ports to power your ESC’s and a couple of XT30 connectors to power auxiliary devices like UBECs and FPV gear. The board comes completes with a full wiring harness. It comes with six coaxial power cables and six signal wires, ready for you to solder to your ESC's and then plug straight into the board. The cables are long; 66cm and 42cm respectively, so they have enough length if you prefer to mount your ESC’s under the motors away from the main frame. The package also comes with high current 10AWG power leads soldered to a 7mm gold plated Amass AS150 anti-spark battery connector. Finally, a foam adhesive pad is included which should be stuck to the back of the board to insulate it from your frame. Im about to place anorder but have a few questions. 1) will the 16mm carbon tube @333 mm increase the diameter of the 680 pro. 2) I know it hase a build in cuircute board but I would prefer the TL6X002 power distribution board and if so whats its maximum amp rating. 1) From memory the 16mm CF tube @333mm is the spare part for the fixed arms found on the 680 pro, the folding arms are shorter. I guess you could change the four folding arms to 333m to increase its diameter. 2) I haven't been able to find a max amp rating for the board, although I would be happy to use it for high current setups, guessing something like >160amps. It's quite large, so to use it with a 680pro, you would need to sit it on the top or underneath the bottom plate - it won't fit between the plates.